Custom made kitting of rubber metal and plastics parts are a common business for ERIKS. Packaging and labelling are made following customer requests. More info can be found at the ERIKS Easy Order System website. Lathe cut rubber offers maximum cost-performance benefits in many applications. For example, a lathe cut rubber washer is usually the best choice where a static seal is needed. Its square or rectangular cross-section provides a wider sealing surface and superior resistance to compression set than molded o-rings. In addition to meeting job specifications, a lathe cut rubber washer is less expensive than molded alternatives. Rubber blankets for the metal packaging industry. Glass and carbon fibre composite rollers, covered with rubber and polyurethane. Also the recovering of the products. Full service for curved spreader rollers (recovering, maintenance, repair,...). Composite sleeves for the flexographic industry : repeat sleeves, rubber covered sleeves, also laser engraved. 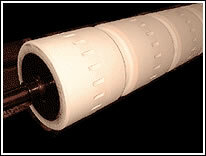 Composite rubber covered sleeves for the gravure printing industry, both cylindrical and tapered. Manufacturing of new steel, stainless steel and aluminium rollers. Grinding and profiling of covered rollers. Measurement of specific properties, laboratory and ageing tests.